Discussion in 'Team Fortress 2 Talk' started by tf2.com, Feb 2, 2012. TF2 characters confirmed for smash bros. I did it in october, now I am rather upset. There is no shortage of new maps. There is a major shortage of "Meet the Pyro." I have to say, though, I'm pessimistic about this TOP SECRET project. The MannCo. Store and the Replay feature are fine, but if this is anything other than updated creation kits or a server-side whitelisting program, I'm concerned. If I had to take a wild, conspiracy theory guess, I'd say it's some kind of total Grordbort crossover having something to do with that cyborg Heavy in Foundry, possibly some kind of crazy new game mode. possibly some kind of crazy new game mode. We could make this sort of stuff.....if we had source film maker. That's cute. They think their plan to release Source Filmmaker with Meet the Pyro is a "secret". Yea its not like we already have a old version of SFM. Some day I'll stop falling for that. It's a workshop-like thing. But for maps. 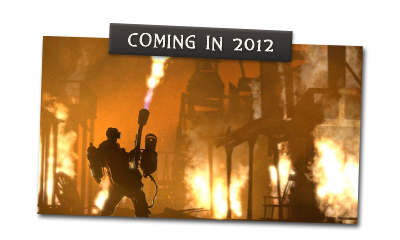 Source Filmmaker would be awesome, but I'm not sure that counts as a TF2 project, so I don't know if they'd announce it on the TF2 blog. Then again, aside from the weird Garry's Mod cult, I guess we're the only people who would use it. If they're willing to highlight cosplay, fanart and random related stuff like that on the blog i'm sure they'd make a post about source film maker, if not on the TF2 blog then as a majour announcement in general.